Our Oxygen Mask transfers the breathing oxygen gas from a storage tank to the lungs of the patients. The Oxygen Mask, offered by us, is disposable and reduces cleaning costs. Moreover, our Oxygen Mask is light in weight and thus is widely demanded by the diverse hospitals, nursing homes, etc. Plastic masks are used primarily by medical care providers for oxygen therapy as they are disposable and reduce cleaning costs. As they are light in weight they are accepted by many patients who may feel uncomfortable wearing an oxygen mask. Plastic masks also allow medical care providers to see through the mask to the face of a patient and determine if they are in distress. 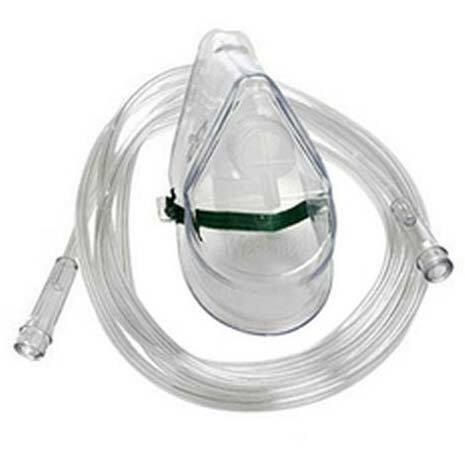 We offer oxygen masks that have been carefully crafted to suit the needs of the user. We have kept the comfort of the user in mind.